Content filtering allows Grid listing, List listing, Carousel, and Slideshow advanced widgets to automatically display items based on content type and subtype, associated taxonomy terms, or a combination of these. The order of items displayed in widgets using the Filtered content source can be managed using the Sorting options. Default sort order sorts the items in the widget alphanumerically according to: page title (for Page content); publication date (for Article content); event date (for Event content); sort name (for Person content). The 'Display to end user' checkbox controls the display of a dropdown filter to users. 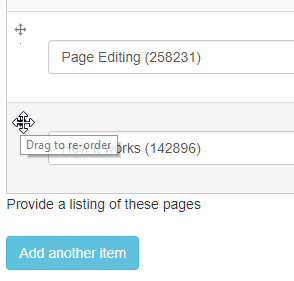 When enabled, the filter can be used to toggle the default sort order between ascending and descending order. If taxonomy terms are applied to content listed in the widget, the order of these terms within the taxonomy can be used to determine the order of items listed in the widget. This allows for custom taxonomies to be created for the purpose of ordering the items in listings. In the Grid listing below, the listing items represent page content and are sorted by the default sort order (alphanumerically by page title). By using custom taxonomy sorting, it's possible to sort the items chronologically. Each of the pages respresented in the Grid listing is tagged with one term from the 'Period' taxonomy. If a listing has been sorted using a custom taxonomy and the listing contains a page which does not have terms from the sorting custom taxonomy associated with it, the listing item for this page will appear at the beginning of the listing, to make it visible to content editors. Pages on the website can handpicked to appear in a listing using the Selected content source. When margins are applied to widgets, a space of 32px appears above/below the widget. Bottom margin: Add/remove bottom margin on the widget. Three widget widths exist in Mosaic. Not all width settings are available to each widget. The widget content is displayed at 66.67% width of the page region containing the widget. The widget content is displayed at 100% width of the page region containing the widget. Full width displays widgets at 100% width of the page content area. Full width settings include augmented styles for some widgets, e.g. Full width for Carousel widgets includes 'peeking' (the edges of Carousel items adjacent to the currently viewed items are visible).